The goal of ideation is to expand the thinking and ideas of everyone on the team, to create something that is greater than the sum of its parts. However, without context and practice, most of us have a tough time expanding beyond what we know (or came up with in the shower). The creative matrix was designed with this in mind. Essentially, the creative matrix is a tool that will help spark new ideas at the intersections of discrete categories. This tool is all about divergent thinking. Best of all, you get to design your own creative matrix based on your design criteria, the market you play in, or the customers you serve (or wish to serve). 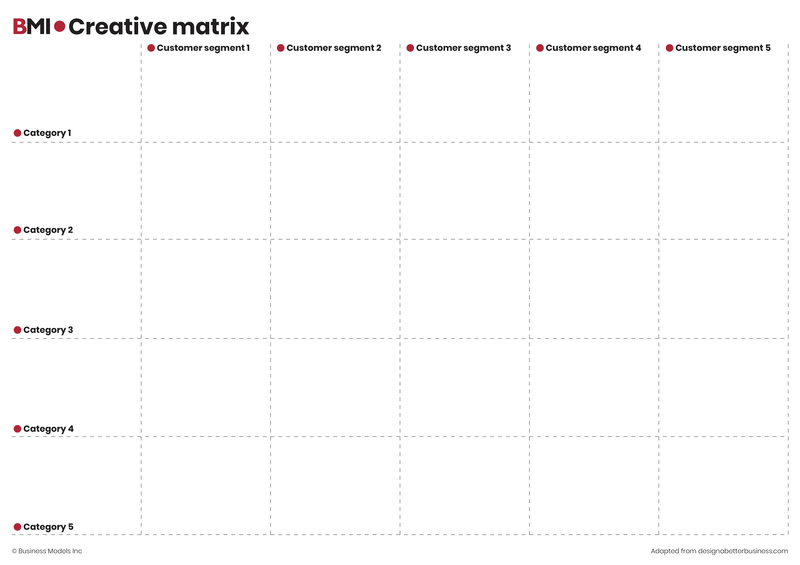 To design your own creative matrix, draw a grid on a whiteboard or poster paper with no more than five rows and five columns. Give it a topic or a central “how might we…?” question. For each of the columns, designate a customer segment (existing or new). For each of the rows, designate a particular technology, enabling solution, or value proposition. You might also opt to designate the end column and/or row as a wild card category, for placing open ideas. With your matrix in place, it’s time to ideate! Using sticky notes, have each person randomly and rapidly add as many ideas as they can come up with to the cells in the matrix. Words are good. Pictures are better! The goal is to fill in every single cell in the creative matrix with at least one idea. To incentivize people to generate more ideas, assign a point for each sticky note. The highest total score wins. Once every cell has been filled in and the time limit is up, it’s time to review everyone’s ideas. Have the team huddle around the create matrix as if it were a painting. Once everyone has had an ample chance to look at each other’s work, have each person call out their favorite ideas (or top two). From there, as a team select the most promising ideas to move forward.